Dr. Fritz Eberhard, SDR Director General, turns the first sod. The transmitter goes into operation. Inauguration of the Stuttgart Television Tower. VHF transmitters for broadcasting radio programmes go into operation. An orientation ring is installed on the observation deck as a guide to the panoramic views. The modified television antenna system goes into operation. The Tower gains 6 metres in height and now measures 217 metres. Arrival of colour television. A second transmitter is installed and the old one renewed. The third generation of television is installed at the base of the Tower. The restaurant at the foot of the Tower is renovated. Start of the Südwest 3 TV series "Treffpunkt Fernsehturm". A new VHF antenna goes into operation. Reopening of the Television Tower's visitor facilities following a nine-month renovation period. A newly-constructed gondola for cleaning the windows goes into operation. The "Lichtzeichen" ("Light Signals") event: for five nights green and red lights climb up the Tower as a warning against the impending climate catastrophe. The project was realised by Ritter, a Pforzheim environmentalist company, in cooperation with Pforzheim University's School of Design. For the Expo 93 International Horticultural Show the Slovenian artist Branko Smon spans three steel cables from the ground to the Tower pod. Attached to them and visible from afar are large, red, luminous windsocks that flutter playfully to and fro according to the force and direction of the wind. For the first time the Tower shaft undergoes thorough renovation, a complicated construction project dependent on prevailing weather conditions. Cosmetic repairs to the building are necessary because of cracks and erosion caused by weathering. In addition, the transmitter mast receives a new coat of paint. Catering contract signed with Willi Weber, Schumacher's manager. Armin Karrer takes over the running of the starred restaurant "Webers Gourmet". The first legal BASE jumps (parachute jumps from fixed objects) take place with the world champion in parachute jumping, Klaus Renz, and an international troupe of BASE jumpers. Renewal of the entire elevator system and the entrance hall. The outer cladding of the Tower pod is renovated and the Tower closes for the first time. Owing to lack of funds, the restaurant and kitchen levels reMayn at the shell stage. The Television Tower celebrates its 50th anniversary. The television transmitters are shut down. First performances in the "Theater Ÿber den Wolken" ("Theatre above the Clouds"). Fritz Leonhardt's 100th birthday. 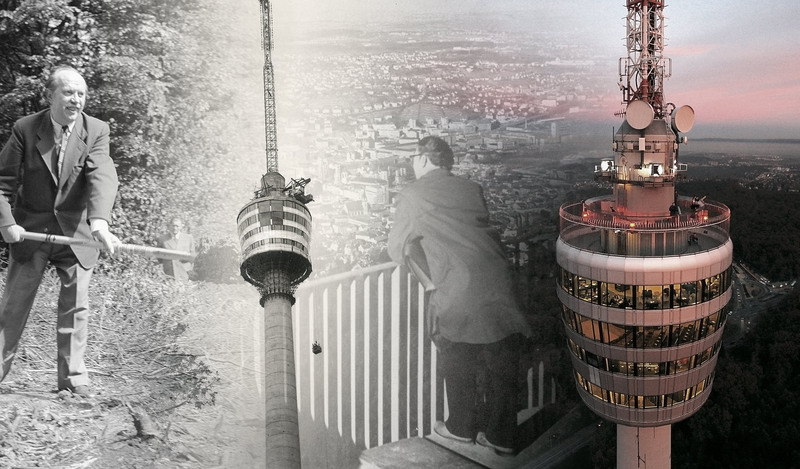 The Television Tower receives the title "Historic Landmark of German Engineering ". Reopening of the catering facilities (café, restaurant, beer garden and shop) following a one-year period of modernisation. For the first time in 57 years, and after 27 million visitors had enjoyed the view with no accidents, the Tower now remains closed to the public by order of the city. After an agreement is reached between the city of Stuttgart and the SWR Media Services GmbH, the operators of the Stuttgart Television Tower, regarding the funding and optimisation of the Tower's fire safety precautions, the period of structural conversion begins. After nearly three years the Television Tower opens its doors to the public again and presents its new shop and entrance area, and of course the same wonderful views as before. The Television Tower celebrates its 60th anniversary and is open 24 hours for the first time in its history on the day of its jubilee. The 200-metre-high steel lattice mast originally planned was to have cost 190,000 DM. Based on first drafts, Leonhardt estimates the additional cost of building a concrete tower as opposed to the lattice mast at 400,000 DM. July 1953: first calculations are somewhere between 950,000 and 1.2 million DM. October 1953: planning and funding discussions between the city administration and the SDR. The estimate mounts to 1.7 million DM. January 1955: the SDR broadcasting council concerns itself with the rising costs of the Tower. By the time the Tower was inaugurated in 1956, the cost of construction had reached 4.2 million DM. This amount was recouped in only five years through admission charges.